Squatter is a fun and entertaining simulation game. Based on real life sheep farming. Every game brings new challenges. As in real life, chance plays a part because no one knows when the next drought or flood will strike. Prudent players employ good strategies and careful management to reduce risks and achieve optimum results. You can enjoy playing Squatter with anywhere between 2 to 6 people. Many games (including card games) require a set number of players. Squatter can happily entertain 2 people or just as easily provide for 3, 4, 5 or 6 players. A wide range of ages from 10 and upwards can play (younger children can enjoy Squatter but may need assistance). While Squatter is designed to entertain adults, never-the-less, children over a wide range of ages, also enjoy playing. Squatter enables several generations to play on an equal footing. Granddad can battle the elements and fluctuating market prices on his sheep station and granddaughter can manage repairs to the shearing sheds and treating foot rot on her own sheep station. Squatter is suitable for family entertainment and promotes family values. Time spent around the table over a game of Squatter provides an ideal opportunity for conversations and discussions that might otherwise never happen. In the past, parlour games and card games were popular entertainment for all ages because they provided a wonderful setting for socialising. Squatter is a classic game that has been enjoyed in Australia and around the world for more than 45 years. Squatter creates winners, not losers and one of the great things about Squatter is that everyone stays in the game until the end. This means the game is enjoyable for all the players, right up to the last throw of the dice. Squatter, together with Scrabble, Monopoly, Cluedo & Sorry belongs to the elite group of brand name board games that have stood the test of time. Squatter provides an informative and entertaining connection with an industry resplendent with social, historic and economic heritage. Commended by Woolmark. Unparalleled in its educational value. Squatter provides a genuine insight into real life farming. Squatter has been commended by the Royal Agriculture Society, The Minister of Agriculture and the Woolmark Company for it's contribution to the Sheep and Wool Industry. The Woolmark Company, which replaced The Australian Wool Bureau, has approved the use of the Woolmark logo because of the relevance Squatter has to the wool industry. To many, the word "Squatter" means someone who illegally lives in another's property. In Australia this usually means settling on public lands without license. However, it is generally accepted, the squatter is one who occupied crown lands under a lease or license. In Australia in the early 1800s, there was great pressure to develop farming and agriculture. Most of the land suitable for agriculture had not yet been surveyed by the government and there was no formal established process for purchasing land. Pioneer farmers went out and started farming the un-surveyed land. These pioneers became known as Squatters. Governor Bourke realised it was futile to try to prevent the expansion of settlement, and decided to regulate it. Under the 1835 Squatting Regulations, Crown land could be taken up on annual licence for a fee of ten pounds per year. In September 1836 Governor Bourke declared the whole Port Phillip District open for settlement under these regulations. 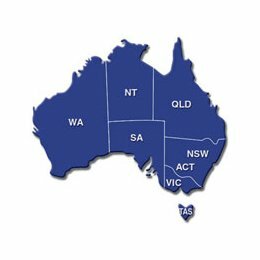 Each Australian state is represented in Squatter. Mt Mitchell Station is named after Mt Mitchell in Western Australia. Coorumbene Station is named after a pioneer sheep grazing property near Loch, Victoria. Melbourne (Victoria) skyline is featured as the town you visit on the playing board. Warramboo Station is named after the township of Warramboo (War-am-boo) in South Australia. "Waramboo" is an aboriginal word meaning "watering place". The Stud Ram "Winton Boy II" is named after the township of Winton in Queensland. Emu Plains Station was named to represent Australia's coat of arms. Emu Plains is also a property in Tasmania and there is another Emu Plans property in Northern Victoria.The Stud Ram "Lachlan Lad" is named after the Lachlan River in New South Wales. 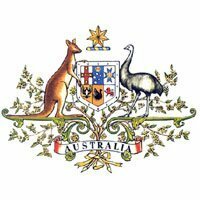 Australia's coat of arms bear a kangaroo and an emu. Neither of these animals can walk backwards. In the game Squatter, Emu Plains Station and Wanbanalong (Wan-ban-a-long) Station are sheep stations named to reflect this Australian heritage. "Wanbanalong" is an aboriginal term that means "place of many kangaroos". The inventor of the Squatter board game is Bob Lloyd. Bob was born and raised in Hampton, Victoria. After the war Bob worked for a couple of years on a farm called "Coorumbene" in South Gippsland, which ran Merino Sheep. 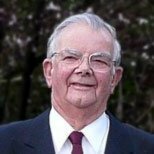 Then in the 1950s Bob took a job as a travelling sales rep for Dalgety's Ltd.
During those years he travelled extensively throughout the rural areas of Victoria and southern New South Wales, and gained valuable knowledge of a wide range of diseases and parasites affecting sheep. 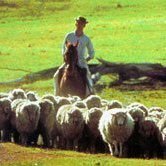 Just as importantly, Bob gained insight into the importance of sound management principles in the raising of sheep and other types of livestock. However, constant travelling took Bob away from his family and he believed that God wanted him to leave his job and serve Him by helping people in the welfare field. With two children and a wife to support he needed something to supplement a drop in income. "I was doing a lot of praying. Then as I was driving past a sheep property in the Wimmera I thought why not invent a game?" The experience gained while working on "Coorumbene" together with the diverse experience meeting farmers face to face provided the solid background to develop a game that in every sense simulates real life farming. Although the basic concept of the game was set down very quickly, it took another six years to finalise the development and convince John Sands Ltd to publish the game. It was first released at the Royal Melbourne Show in 1962 on the Australian Wool Bureau stand. In 2007 (45 years after release) Squatter reached 500,000 sales.